The Dark Ranger: A wake up call from a rivalry past. Ah, our annual Vancouver reality check. Though this was more along the lines of Horror Fantasy, than reality... The goalie stopping all the pucks was not Roberto Luongo, the man whose reputation precedes him. It was Raycroft. A guy whose first name it takes me a few moments to recall. Anyway, "whats his face" had plenty of help from us as we shot over, to the side, and around him and the goal for most of the night. Official Recap here. While the Nuck defense can take some credit for our poor shooting and non shooting, it was a problem that lied merely on the perimeter of our stink last night. For a good part of the contest, we went defense for defense with a Vancouver team that specializes in it. That's pretty surprising considering the reputation for our defensive prowess, so far this season. James Bond seemed to have nothing on us as our license to kill saw Vancouver only 1 for 6 on the powerplay. I personally thought the Canuck powerplay was rather anemic and us forcing turnovers was helped out often by their miscommunication. It was only after our biggest gaffes that Keslar, Samuelsson, and the rest of the Vancouver team were able to tally. Even still... changes at the wrong time, a too many men penalty, lazy backchecks and missed switching on defensive coverage should remain cardinal sins on a team nursing 2 young defensemen and weening 2 others. It will take a team effort to keep the soft underbelly of this team from being exposed for the rest of the season. That brings me to my biggest problem with last night. As I sat there watching the third period through a set of heavy eyelids (I'll attribute it to age and not our effort), I suddenly heard one of usual commercials interrupted as a cut back to the game revealed a melee on the ice. "Really, a melee? good ole fashioned donnybrook involving my boys in blue?!?!" As I started to salivate like a Pavlovian dog at flashbacks of Cloutier pummeling Salo into oblivion, I snapped back to reality and watching a glorified shoving match for about 5 minutes. To my surprise, it was all started by Gaborik giving notice to the Vancouver team by way of a little shove that hes not about to take any of their crap(during the commerical and line change). That set off a ten man shoving contest and pair offs on the ice. The only Rangers that seemed to be serious about getting nasty in the whole thing was Byers, Gaborik, and Voros (who was trying to assist Byers). Girardi who was making his own stand, kept Byers (who kept his barking up even in the penalty box) company for the 10 min while serving matching misconducts. Vancouver also lost 2 players for 10. 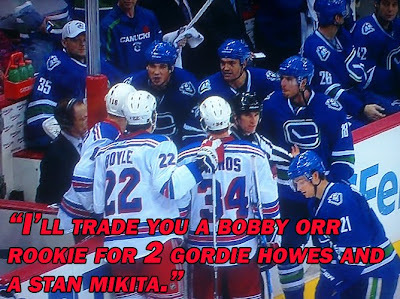 (including Bieksa, who was playing the role of Gaboriks attempted intimidator). The fun didn't stop there though, as the action convened at the benches. Avery and O'Brien 'shared some recipes'... and Avery's taunting drew a physical reaction O'Brien, which got the Nucks an extra two minutes and put the Rangers on a powerplay. Voros would pick up a slashing call after the powerplay ended (no doubt trying to pick another fight he couldn't win). 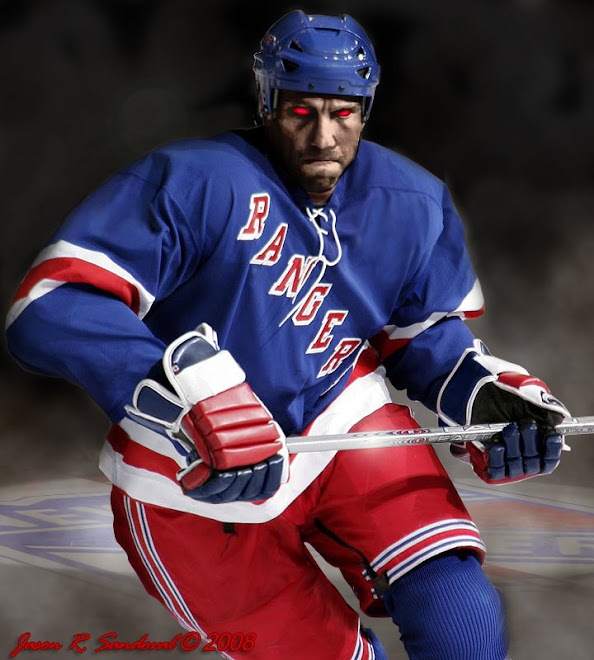 Byers would emerge from serving his misconduct only to go after Vancouver tough guy Tanner Glass. Byers found Glass's name to be a misnomer, got all he could handle and then some, but hung in there just the same. Byers has lived up to my expectations since I had hoped he'd make the team 3 years ago. I'm also surprised to find that Gaboriks got a little bit of snarl. Unfortunately, the same can't be said for our new enforcer, our Zen agitator, and the rest of this club, at this point. This was a game we wanted to win on the scoreboard. Unfortunately when we couldn't do that, Vancouver sought to take our dignity too... and made it clear the team's fans and the city haven't forgotten that we took the cup from Canada while under their watch and it hasn't gone back since. I'm a little disappointed that the only people that answered the call were our Scorer, the kid from the farm, and the village idiot(I know I give Voros a lot of crap- but I will take this opportunity to commend him for trying). This used to be the kind of game, much like our local rivalry games, where you knew going in... that it wasn't just another game. In fact, to revisit an annoyance I had earlier this season when we first played the Devils, I believe Dubi was quoted as saying "its just another 2 points", when asked about the rivalry factor. It may be just another 2 points to Dubi, now that he's got his pockets lined... but for some of the fans of the team, bragging rights is all we have. Now, I know you can't get onto the scoreboard or into the playoffs on dignity or bragging rights... but to wear our jersey, to be part of this team, to carry the tradition, the honor, the pride of all the fans that have ever cheered for this team and the people of this city... you have to show up and prove you belong. One only has to look at the latest "rivalry game" at the mausoleum for proof. After the team folded their tents and packed it in, Ranger fans went to war in the stands...because if you won't show what it means to wear that Jersey, WE WILL! It's nothing new, it happens year after year. It's part of the rivalry, and perhaps part of something that's been forgotten by kids holding out for more money, and punks beating up cab drivers over a dime. A good bench clearer is what this team needs to get itself out of this funk and pull it together. We were presented with an opportunity last night and while only a few took the opportunity, lets hope many more got the message. 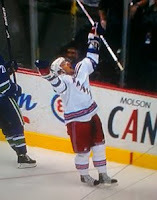 "FINALLY..."Chris Higgins reaction to netting his first of the season and getting past the drought was kind of funny, as he looked toward the heavens like Andy Dufresne after escaping from Shawshank. As funny as Higgins reaction was, it couldn't match the hilarity of Ray Ferraro's reaction to be stuck in his little box in between the benches during the O'brien/Avery summit. I dont post comments usually but this was the best post I have ever read at this site and there have been some good ones. HAIL J_UNDISPUTED !!!!!! I crowne him King of Posts! It is close to brilliant! If I ever have to read another complaining Rangers fan blog, may this blog and post represent the fan in the purest sense. I agree there was a unique opportunity to rise forward as a team, even with 10 bluemen on the ice there never seemed to be the urgency necessary to use in the next potential four points out west. Coach Torts should pay his fine and be pissed because no one truly lived up to the fine. Good job on the post and keep up the surprisingly good work Dark writers. Critiques, positive or negative, are most appreciated. Also thanks for your patience as I experimented with a different style for a post or two. Also, there will be an update coming soon to the Iamadarkranger site. I think we have a winner to the he said what?!?! race between Torts, Avery and Brashear. Anyone who heard Avery's sweet nothings to Hordichuk the other night already knows what I am talking about.